I don’t like to say anything that negative about a film. Well, unless it deserves it and Vacation is one of that sort of film. The more I see of it, the more I think it’s going to be a car crash of a movie. One that, even from the trailer, will have a good chance at next year’s Razzie awards. For how many, who knows but it could sweep the boards with nominations. Now, with that off mu chest, we have been sent two things from the film. The first is the new poster for the film. The other is the clean version of the trailer that was released about a month ago. It doesn’t improve the look of the film. It just makes it more painful to watch what has happened to a once good franchise. 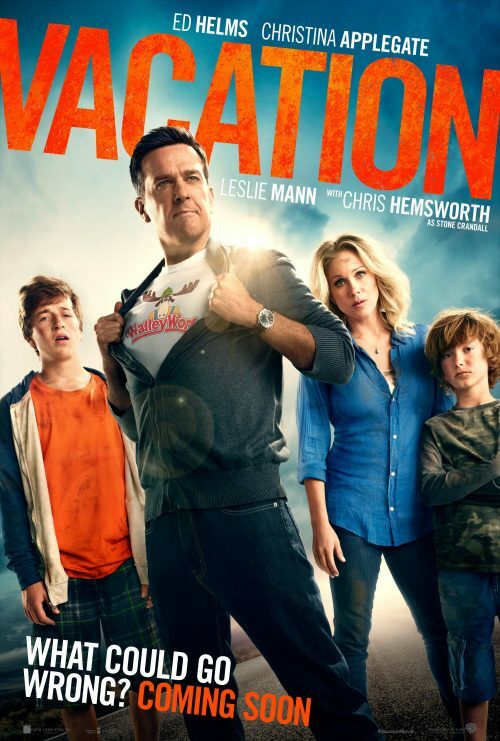 Following in his father’s footsteps and hoping for some much-needed family bonding, a grown-up Rusty Griswold surprises his wife, Debbie, and their two sons with a cross-country trip back to America’s “favorite family fun park,” Walley World.